The day I decided I loved frittatas was the day I decided I would never again try and flip the entire thing out of the pan to serve it. Maybe it’s my lack of confidence when flipping over the pan? Maybe it was never meant to be? Despite trying to be “Fearless!”, as Juila Child would say, I’ve had a few not so pretty attempts at un-panning a frittata. But hey, they say you have to make every mistake in the kitchen once. Or 3 times. 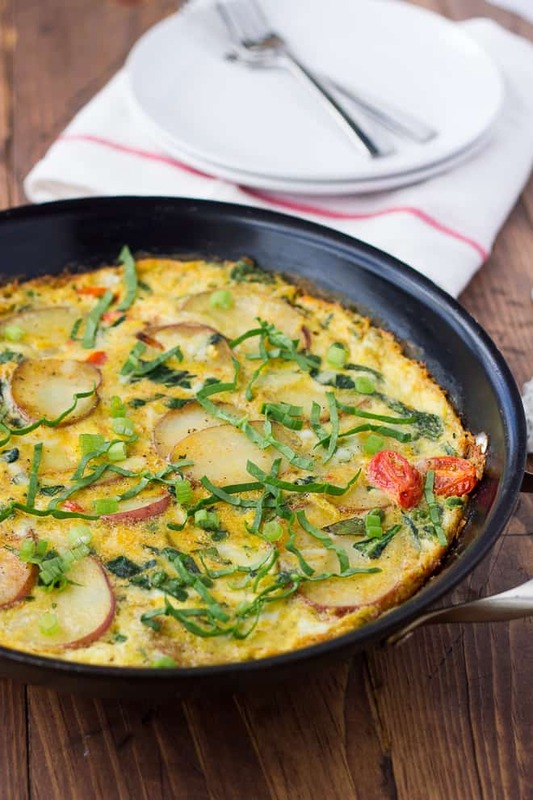 All I know is ever since I embraced the slice-and-serve-out-of-the-pan technique, I fell back in love with frittatas. Which is good, because there really is so much to be in love with. Everyone has a favorite go-to egg dish. This frittata happens to be mine! Usually when I make frittatas or egg scrambles I just throw in whatever vegetables I need to use up from my fridge. However, I go out of my way to buy ingredients for this exact combination. The potatoes, cheese, and spinach just belong together. 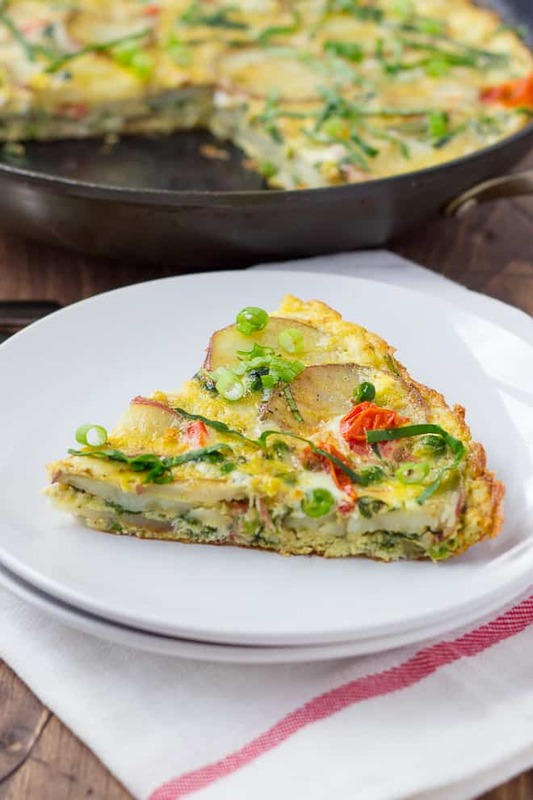 Great for breakfast, lunch or dinner, this frittata makes for a satisfying, 1-pan meal that is full of vegetables. It doesn’t get much better than that in my book! Heat 1 tablespoon of olive oil in a non-stick, oven-safe pan (or cast iron skillet) over medium heat. Add the potatoes and saute for 7-10 minutes until tender. Meanwhile, whisk the eggs, basil, and cheese together in a bowl and set aside. Remove the potatoes from the pan and set aside. Add the remaining olive oil and cook the green onion, tomatoes, and frozen peas for 3-4 minutes over medium heat. Add the spinach and garlic and cook for another 30 seconds or so. Pour in the egg mixture and reduce the heat. 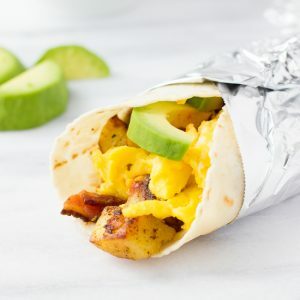 Scramble the eggs for 1 minute then add in the potatoes. Cook for another 3-4 minutes until the egg starts to set. Smooth into an even layer and place in the oven for 10-12 minutes until the eggs have set. Slice and serve topped with more basil and cheese if desired. Enjoy! 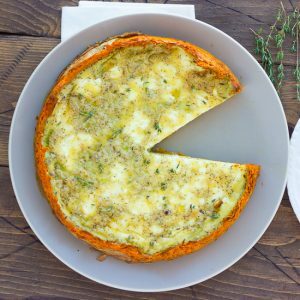 I love frittatas and this one looks especially yummy! Plus, you’re right…flipping is overrated! WOW these pics are gorgeous, trying this tonight! Check out my blog lizzyw.com – I think you would like it!